There is a lot of really interesting things happening in healthcare. Many are trying to change healthcare as we know it today. Many have the promise of lowering costs, improved care, and better health. However, each of these movements, initiatives, or trends are at different points of the famous maturity lifecycle. 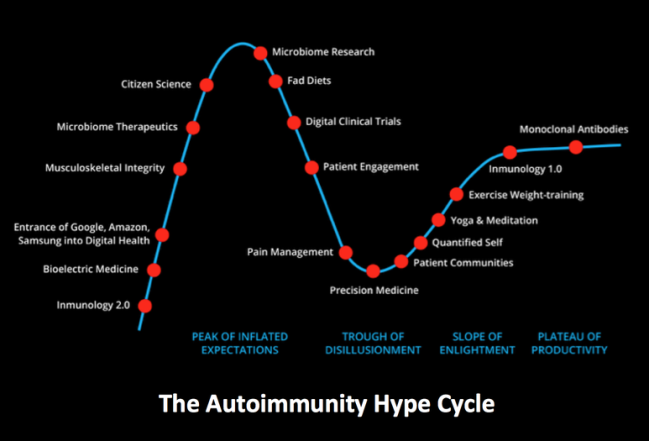 I should mention that this graphic is focused on Autoimmunity, but you could see how this applies to so many areas of healthcare. A few minor changes and it would be all of healthcare. What other items would you add to this hype cycle? Would you move anything on the chart above farther along the line or backwards on the line?